The average age of an NHL starting goaltender this season was 29.1 years so yes, people are right to say that soon to be 26 year old Carey Price is young. In term of years on this planet, Price tied for 23rd youngest among starters with just 3 goalies 1 or more years his junior. Marc Bergevin was also right to say that goaltenders develop later than all other positions but the age issue is starting to become a bit of a crutch for Carey Price who just finished year 1 of a 6 year contract as the 3rd highest cap hit goaltender in the NHL. In terms of experience, however, Carey Price isn’t young at all. At least not when you consider that only 10 starting goaltenders this season have more NHL experience than he does, thanks in large part to Bob Gainey’s plan as GM to fast-track his development to The Show. At first glance, it looks like Carey Price had a bad year, finishing the regular season with a 2.59 GAA and a .905 SA%, thanks in large part to a brutal 4th quarter where Price’s confidence and ability to have strong rebound games went completely off the rails. And yes, that 3.75 GAA and .870 SA% over his last 9 games was brutal… and unfortunately, it carried over into the playoffs. Hidden in his regular season numbers was the negative impact of the Habs penalty killing unit. Ranked 23rd in PK% and 25th in power play goals against. It's easy to point fingers at faux problems like PK formations; especially the diamond that happens to be the most commonly used PK formation in the NHL, and for good reason. What hasn’t been mentioned is Carey’s .804 SA% while killing penalties during the regular season. Not only was it the worst of his 6 year career in Montreal but it was also the worst SA% among the top 30 goaltenders in the NHL this season and by a country mile when you consider the average SA% was .865. Blame the coaches, formation or player selections all you want but there’s no escaping the fact that Carey Price didn’t come close to doing his part for the team on the PK. So yes, his regular season stats are a bit more representative of his overall performance, though they don’t tell the whole story. 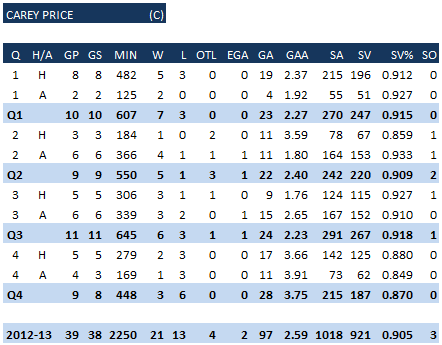 To fully understand his regular season stats, it’s important to look at Price’s even strength SA% and his 5v5 GAA/60. 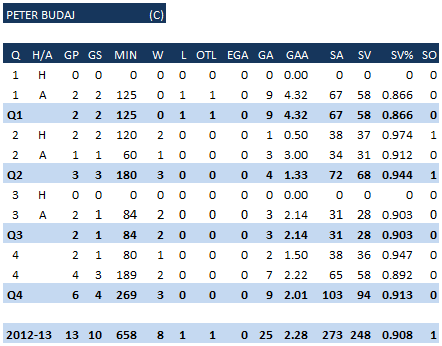 This season, .924 was the league average save percentage at even strength and Carey finished the year at .920. So, slightly less than average. His 2.07 5v5 GAA/60 is noteworthy for being the 2nd best of his NHL career, which is a definite positive for a team under Marc Bergevin and Michel Therrien that finally took even strength scoring differential seriously for the first time in over 15 years. Better late than never I suppose. That said, 2.07 ranked as 15th best among starting goaltenders. Before his slump and/or regression, whichever you fancy using in a shortened season small sample size, Carey was 7th through 36 games. Unfortunately, the standard NHL season is much longer than that so if we look at Price's average 5v5 GAA/60 ranking over his career, he slots in at 18th best among starters. So, take your pick between average and slightly less than average. 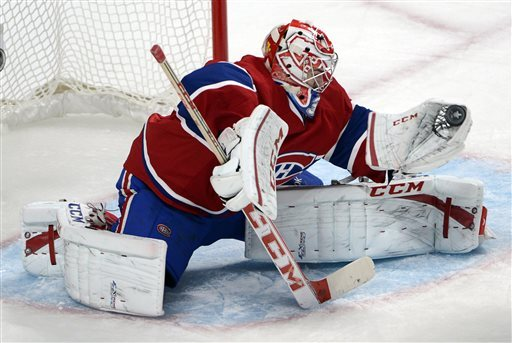 Since Carey Price came into the NHL in 2007-08, the league average regular season save percentage at even strength is .922. Now with 340 total NHL games of experience, Carey’s ES SA% is slightly above average at .924. So, when you strip away most of the background noise and focus on how he fared on even footing with other starters around the league, Carey Price wasn’t bad this year. He was merely average. Average, the reoccurring descriptor for Carey Price, even though his cap hit is the 3rd highest among goaltenders and he's now the 11th most experienced starter in the NHL. Seems obvious but Paul Maurice was dead-on with that line while sitting with the TSN panel during the opening nights of round one. If a goalie can't deliver an upper echelon playoff performance, their team won't go far. Elite goalies find a way to elevate their game when it matters most and are more consistent in doing so over time while others either wilt under the pressure or catch lightning in a bottle for a run that'll never be repeated. Since 2007-08, the league average playoff save percentage at even strength is .925 which is slightly higher than the .922 regular season rate. Better teams, defense and goaltending all contributing to tighter ES scoring. Carey Price after 30 games of playoff experience? A piss-poor .906. One cannot overstate just how bad that number is when placed in proper context. The fact that Price has only hit the playoff league average in 1 of 5 years is simply unacceptable and alarming given his salary, experience and expectations going forward. Now's as good a time as any to mention the average ES SA% of the last 10 Stanley Cup winning goaltenders is .938. Anyone who suggests that Carey Price hasn’t been a disappointment in the playoffs or blames management, coaches, teammates or points to his youth/inexperience are just fooling themselves and others at this point. In his latest playoff run against the Ottawa Senators, Price made the initial save on just 2 of the 13 goals he allowed over his 4 games. Yet again, not good enough. Even though the Habs outshot the Ottawa Senators at even strength, 44 to 35 from within 25 feet through those 4 games, Price allowed 7 goals in close for an utterly disappointing .800 SA%. The league average SA% at danger close during the playoffs these days? .900. Before I proceed further, anyone who puts stock in the NHL’s official stats on shot distance beyond 25 feet simply shouldn’t. They’re crap; useless for any serious study. Last year, while breaking down the Habs shot quality over time for trends, I compared where shots and goals were recorded by the NHL to where they actually occurred on the ice in video highlights and game tape. The difference was often so great that it'd be comical if it weren't for the fact so many people trust the numbers produced by the NHL. It's embarrassing really. Having said that, shots recorded within 25 feet of the net as a whole (not broken down further) are functionally accurate because of one-timers and the need for a quick release from limited time and space. At least from there, mistakes of 5 feet or so don't change the overall percentages to any notable degree. A trial balloon has been floated by some that bad luck on shooting percentage was the main reason the Habs didn't send the Senators packing in round one. Truth be told, of the 44 even strength shots the Canadiens got within 25 feet of Anderson during the Price's 4 games; Pacioretty (3), Ryder (3), Gionta (2), Plekanec (1) and Desharnais (1) accounted for just 23% of those shots. Gionta’s injury makes his number understandable and even though Pacioretty was playing with a separated shoulder, he’s a big body that has continued to live on the perimeter regardless. Leading the way among the forwards crashing the net for close-in shots vs. the Sens was Galchenyuk (9), Bourque (7), Gallagher (4), Prust (4) who I might add was a lot more banged up than Pacioretty, Moen (3), White (2) and Halpern (1). The remaining 4 shots coming from defensemen. You can't call it bad luck when the Habs best snipers didn't get close enough, often enough, leaving 2 raw rookies and 2 vets in their first full seasons with Montreal to carry the offensive load. It was broad failure by the offensive core of the Montreal Canadiens forwards to commit, pay the price and go where the goals are in the playoffs, not bad luck. Anderson's .886 ES SA% close-in vs. Price's .800 SA% made it no contest, especially when you factor in making initial saves on just 2 of his 13 goals against. Fact is, Carey Price was so bad and off his game for weeks leading into the playoffs that even with a healthy roster in the second season, the Habs wouldn’t have been able to generate enough offense to overcome his inconsistent goaltending to win the series. Does Carey Price have the talent to be a top 5 goalie in the NHL over the next 5 years to justify his salary and expectations? It’s hard to say at this point beyond hoping that he does. So far, Price has just been average when average won't do. Elite goalies find a way to elevate their game when they matter most but to date, Carey Price hasn’t come close, save for 2010-11. Believing 2 good regular seasons in 6 and just 1 in 5 during the playoffs is a sign of a better tomorrow? That's cold-filtered blind faith right there. Fact of the matter is, Carey Price has just been average in the regular season and a major disappointment come playoff time. So, until his actual play matches the salary and the expectations placed on him, including Price himself, there will be doubters and concerned Habs fans. And deservedly so. I sincerely hope Carey can elevate his game but growing concerns that he might not are completely justified at this point. This will be short and sweet. Budaj is an average, veteran backup who had a decent regular season though it must be said that 38 goaltenders who played at least as much as he did had a better ES SA%. At just .912 it was well below the .922 league average and an indication he isn't a long term solution if Carey Price ever got knocked out for any length of time. During the playoffs, Budaj was clearly scared to death in relief of Carey Price. Shaky is his brief OT appearance in Game 4 was understandable but his play in the Habs "Out like lambs" performance in Game 5 was simply embarrassing.